North Carolina is lucky to have a very rich heritage of literature—especially since the 1920s, when Paul Green won a Pulitzer Prize for his play In Abraham's Bosom, and Thomas Wolfe's powerful novels burst onto the scene. So many Tar Heel writers have followed their trail that it has become common to read about "North Carolina's Literary Renaissance." We have great North Carolina writing to please almost any taste and to focus on almost every corner of the state, as if through a camera lens. Let's look at a few examples of writers who use community and history among their creative tools. One of the first North Carolina writers to make a national mark was an enslaved man who eventually became the third African American in the United States—and the first in the South—to publish a book. It was illegal to teach slaves to read and write, but in Chatham County young George Moses Horton (born about 1797) skirted that law. He would hang around where white children were being taught, then pick up books and papers they had left behind. Horton earned money by writing poems for university students in Chapel Hill. Eventually, with the help of white patrons, or supporters who recognized his talent, he published three collections. These writings examined many things about Horton's daily experiences in the North Carolina that he knew. They proclaimed in full honesty both the lack of hope that scarred his life and his deep wish for freedom. Almost a hundred years later, Thomas Wolfe (1900–1938) provided a vivid picture of Asheville in Look Homeward, Angel: The Story of a Buried Life. This long, rambling 1929 novel was based on Wolfe's years growing up there. His energetic, poetic writing brings to life not only his not-very-functional family, but also his then-small Mountain hometown. The novel's subtitle, The Story of a Buried Life, refers to Wolfe's unhappiness with what he considered a stifling, or crushing, environment. Unlike tourists who loved the lush scenery of the Blue Ridge Mountains, young Wolfe felt hemmed in and trapped by them; he wanted to leave and explore the bigger world. In contrast, another Asheville native just twenty years younger than Wolfe, Wilma Dykeman (1920–2006), traveled around the world but always focused her writing on the Appalachian Mountain region. All sixteen of Dykeman's books—both fiction and nonfiction—are about this region that she loved. Especially important is Dykeman's first novel, The Tall Woman (1962), which tells the story of Lydia McQueen, a woman living a tough, hardscrabble life on an Appalachian farm during and after the Civil War. An interesting character, Lydia deals with many struggles that western North Carolinians faced during that hard time: poverty; conflict between people who favored the Union and those who supported the Confederacy; racism (against Melungeons, dark-skinned people of uncertain multiracial origin); and devastation of the environment. Dykeman and her family were among the first to speak out, in writings and public lectures, against racial injustice and environmental destruction. When she died, the Associated Press named her as "among the first writers to offer a stark portrait of what she called 'the unique virtues and tragic flaws' of mountain people." Across the state, Suzanne Newton (b. 1936) has explored the lives of younger characters, ages twelve to eighteen, in nine award-winning, young adult novels. All of the books take place in small, eastern North Carolina towns like those in which Newton grew up: Bath, "Little" Washington (the one on the Pamlico River), and Manteo. People have praised Newton's novels for their honest approach to the problems young people face growing up, as well as her realistic descriptions of life in small southern towns. The New York Times named her most honored work, I Will Call It Georgie's Blues, as one of the ten best young adult novels of 1983. Farther south, near Clarkton, Guy Owen (1925–1981) grew up on a tobacco farm. After earning three degrees at the University of North Carolina at Chapel Hill, Owen never again worked on a farm. But as a writer, he plowed those fields forever. In his poetry and novels, he captured the work, beliefs, joys, and hardships of people who lived the life he had known as a boy. His best-known work, The Ballad of the Flim-Flam Man (1965)—which became an award-winning movie—is a comic novel based on the hilarious adventures of con men who took advantage of the greedy and gullible, or easily cheated, especially around the time of tobacco auctions. A more serious novel, Journey for Joedel (1970), follows a boy who excitedly goes with his father to a tobacco auction. Readers can almost smell the cured yellow leaves and feel the sweat of farmers hoping for a good sale. A more current Tar Heel State writer who has kept alive the stories of the working people she knows is Barbara Presnell (b. 1954). Presnell grew up in Asheboro, when textile mills employed hundreds of people in that area. Her Piece Work (2007)—winner of a major national poetry prize and soon to be produced as a play—is a series of dramatic monologues, or speeches given by one character or actor, in which textile workers tell their stories. In stark and lively language, they say what their work means to them—the good and the bad. Then comes what has become a familiar story in too many American towns based on manufacturing: the mills close, moving their work to other countries. In the final monologues, readers hear the anguish and hurt of people who have lost not just their jobs but a community and a way of finding meaning in their lives. 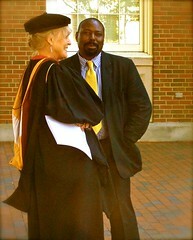 Another North Carolina poet, Lenard Moore (b. 1958), uses many of his poems to explore daily life in Jacksonville, the town where he was born. This U.S. Army veteran and the son of a former marine has been honored repeatedly—even internationally—for his mastery of the haiku form of poetry. One of Moore's collections, Desert Storm: A Brief History (1993), is made up entirely of haiku that brings to life the experiences of soldiers in the 1991 Gulf War. Moore is also known for his leadership of the Carolina African American Writers' Collective, which since 1989 has brought together aspiring and professional African American writers from across the state. Perhaps our most versatile Tar Heel writer is Fred Chappell (b. 1936), who has proven equally talented at writing poetry, fiction, and nonfiction. As a boy, Chappell loved to read science fiction. Although much of his writing is based on life in Canton—the town in the Mountains where he grew up—he has written fantasy tales and sometimes spiced up otherwise realistic stories with bits of fantasy. Chappell's 1985 novel I Am One of You Forever, which deals with a boy much like himself growing up in western North Carolina, has been called "a perfect balance of fantasy, tall tale, and fact." As a classic growing-up story, the book has been compared to Huckleberry Finn and To Kill a Mockingbird. Chappell has written thirty books, and he served as poet laureate of the state from 1997 until 2002. These represent only a few of the wonderful Tar Heel writers whose works carry us to other times, other places, other lives—or perhaps plunge us more deeply into our own times, our own communities. Randall Kenan's fiction takes us to Tim's Creek, based on Chinquapin, where he grew up. Doris Betts's fiction makes ordinary people—millworkers, highway patrolmen—come alive as they face love and conflict. Sarah Dessen writes about how young adults confront the adult world. At your nearest bookstore or public library, you can find the works of your writing neighbors. Reading them will enrich your life. It might teach you about North Carolina and its history. NCCulture, November 17, 2004. 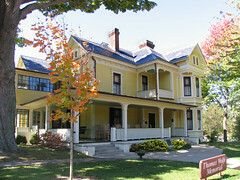 "Thomas Wolfe Memorial." Located at http://www.flickr.com/photos/ncculture/3117779981/. Accessed February 23, 2012. NCCulture, June 7, 2007. "Historic Bath". Located at http://www.flickr.com/photos/ncculture/3117778691/. Accessed February 23, 2012. MyStuart, October 12, 2010. "Academic Chat." Randall Kenan at Univeristy Day. Located at http://www.flickr.com/photos/melystu/5739342817/. Accessed February 23, 2012. T23E, November 22, 2009. 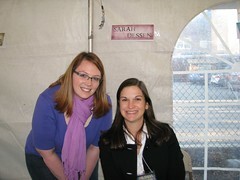 "Me w/ Sarah Dessen!" Located at http://www.flickr.com/photos/t23e/4131754077/. Accessed February 23, 2012. Hi Melinda -- Thanks for sharing your photo with NCpedia! Nice to see my pic of Randall Kenan working here!! NCpedia is a great website! Thanks for using my photo of Randall Kenan at UNC on this page. . . .looks great!